These photos from the British Library Images Online web site provided the inspiration for my costume design. This first image gives a good idea of what the pants shape should look like, full at the hips, and narrow at the ankles. 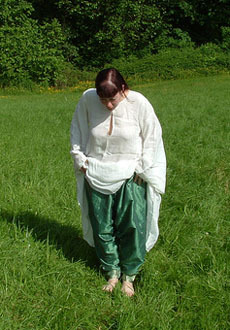 The gömlek (white overblouse) is very long and sheer with wide sleeves and decorated seams. This blue chirka (vest) is about half as long as the distance between her shoulders and her feet. It flares very little around the hips. It is open under the sash belt. It looks like it has buttons all the way up to the small round neckline (can't see for sure) but is only closed from bust to belt. The armholes are fairly deep but straight, not shaped. I can't determine whether it is lined. There is not enough detail in the original photo to determine specific information about the closures or the fabric. This image of someone wearing a red chirka shows no seam decoration on the gömlek, a different hat, and a similar shape of pant leg. 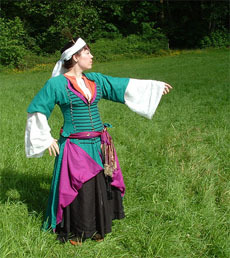 The chirka is about half as long as the distance between her shoulders and her feet. It flares around the hips. It buttons from under the bust to the sash belt and is opened below the belt. I can't see any indications of buttons above the bust. It has a small round neckline. The armholes look higher than the blue one above by a bit and they look straight, not shaped. I can't determine whether there is a lining. There is not enough detail in the photo to make out specifics in closures or fabrics. There are not many images to show what a chirka looks like. I used these two illustrations from the British Library as an example. I am still quite convinced that this layer provides bust support. This is my interpretation of what I see. It is of course stylized to the artist’s preference. It may or may not have been the same artist, though they were both in the same album. It isn't a photograph. I still haven't seen any physical examples. All this is my interpretation. For the entari (coat), I like this image. I think it is a good example of what I am trying to make. It is from the British Library Images Online, which identifies it as Ottoman from circa 1600 CE. The neckline is a small circle and it is worn open to just under the bust, though the buttons seem to continue up to the neckline and stop under the sash belt. The sleeves are elbow length and wide. The body fits snugly while the hem is wider. You can see the gömlek peeking out at the hem. The green bit could be lining of the entari, or another long entari poking out. A good physical extant example appears in a photograph on Dar Anahita's web site in the section titled "Third Layer". This blue entari pictured at that link is believed to have belonged to a female from late 16 early 17th century CE. The same entari is shown in two photos - in one it is hanging, and in the other, it is displayed flat. It has the same weird gore shape on the sides, fitted in the body, bell shaped hemline with a small gore on the front, buttoned down the front to just below the belt line. You can see that when it hangs, the odd side gore shape just adds volume to the hips, which if you check out the images from contemporary artists, that is what is stylized and accentuated. The photo to the right shows me wearing the gömlek (shirt) and shalvar (pants) from the pattern I designed based on the above inspirations. I'm holding up the bottom of the gömlek to make it easier to see details of what the shalvar look like. The pants are cut from a medium stiff smooth silk sari that has metal threads in a white gold colour woven in. They are fairly light, though insulative enough for both cool and hot weather. I don't think I needed to make the crotch gore that large, though, so the next pair will be better and more authentically patterned for proper Turkish. They do have pockets though. 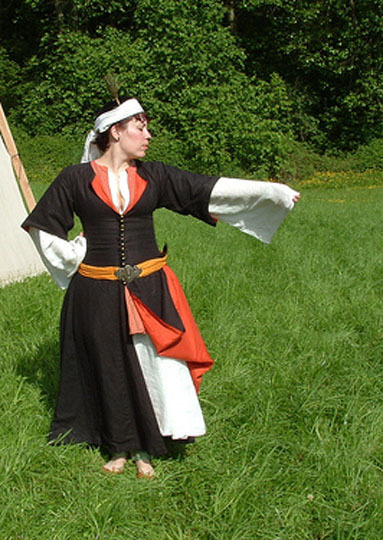 The gömlek is made of a looseweave linen, making it fairly light and drapey like a thick cheesecloth. It is cut with the square underarm gussets, with the side gussets gathered in like but with flared sleeves rather than tapered ones. Below is the pattern diagram showing the layout for the gömlek and shalvar with a small hat taking up the last corner. Each graph square represents 5 inches. The solid lines show where to cut, and the dotted lines show where to fold. I really simplified the pants, and I wouldn’t think of these pants as a period pattern. I just winged it to get the right shape that I wanted. Click on the pattern diagram below for a larger, more detailed version suitable for printing. My chirka pattern consists of two layers of the same fabric. It would have taken less than a meter of the fabric if I had done only one layer. This is my support layer, so it fits really tightly around the point where a bra band would sit. It sewed together in about 2 hours. Mine is lined in a fairly heavy linen, and the outer fabric is fairly stiff. This garment is not an outer layer for public wandering. At least one entari must be worn over it. I was not able to find anything in the way of extant examples of this, so I had to work it out on my own using a few images from the time. 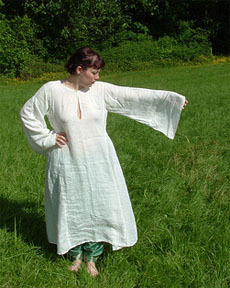 Although the pattern in the diagram below would result in a sleeveless chirka, sleeves can be added as shown in this photo. There is historical evidence of both sleeveless and with sleeves. There are two gores for the front, one on each side. They overlap because of the flare. Each body panel gets two gores, one on each side. That makes it go smoothly when sewing the body panels together. For the button loops, I used round shoelace (not the wide flat stuff). It's durable, strong, and not too stretchy. You don't even have to cut it, you can just loop it and sew it down. The entari is worn as an outer layer, over all the other pieces described above. This one is black linen lined in a nice contrasting color of silk, and it fits very tightly under the bust. This pattern is based on a couple of period examples and images. The shapes of the pattern pieces are very rectangular and triangular; there is not much in the way of curves in the cutting. 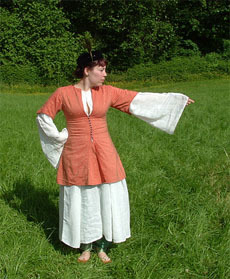 This one also has a pair of button-in sleeves that work really well and are painfully easy to make. My entari pattern can fit very well for a variety of sizes, I take enough in under the arms to make it supportive and fit narrowly across the body. This is my final outer layer entari. It is made of cotton lined in thin, fine cotton. I need to redo the braid loops down the front. I found that using soutache doesn't work; it is starting to fall apart. I wish I could get better detailed images of the extant ones. This coat is loose enough to be done up all the way to the neck over the bosom. Top it all off with a small velvet hat that has a strip of silk tied around it, some little leather slippers, and a bunch of different sash belts, and I am set to go! In the Society for Creative Anachronism (SCA) my name is Agnes Cresewyke who resides in the barony of Lions Gate in the principality of Tir Righ in the kingdom of An Tir. I sew, I embellish, I craft in leather, fabric, wood, metal and food. I focus mainly on the 14th century English. I do some 16th century Flemish, and some 16th century Turkish as well. I originally posted this article on my LiveJournal account on June 21, 2012. In the belly dance world, in the past I have danced tribal fusion with Orchid and I have danced American Tribal Style with Belly Belly Hip. Currently, my dancing is primarily at SCA events. I make costume bits and whole outfits to look smashing and well put together. At home I am an artist who paints, sculpts, plays with clay, makes prints, draws, and creates in a variety of ways with many materials. 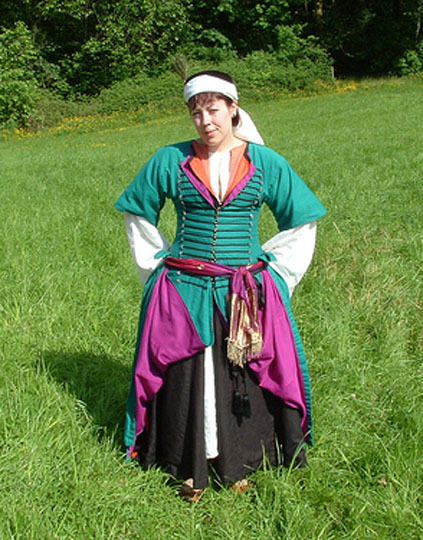 Belly Dance Costuming for SCA and Renaissance Faires. 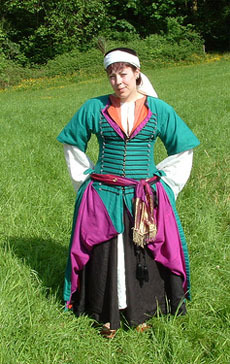 Overview of period-compliant costuming options. 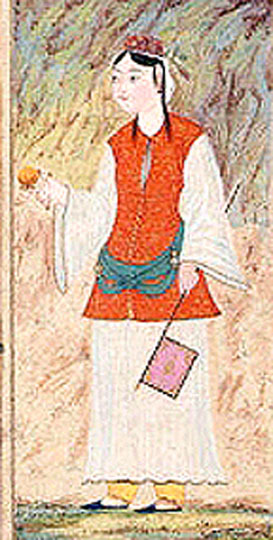 Pants in the 16th Century. By Dawn Devine Brown. 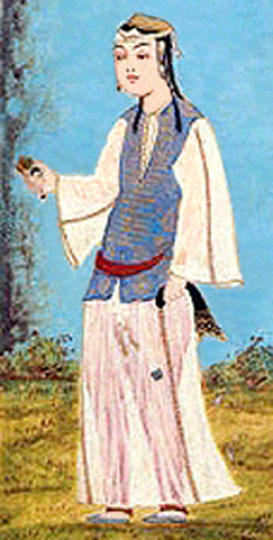 Styles of pants worn by women in the Ottoman and Safavid cultures.